I had a bit of time over the weekend and the freezer had some hops in it that weren’t getting any younger. What’s a bloke supposed to do other than get brewing? Exactly. So that’s what I did. Something light and hoppy felt like a good idea. When doesn’t it? Marris otter pale malt, some crystal and caramalt for colour and sweetness, flaked barley for body and head retention. Simple. Bittered with amarillo and target hops to 35 bitterness units and then flavoured with loads of centennial, chinook, cascade and more amarillo. Colour? Think somewhere between deep straw and golden ray of sunshine; an original gravity of 1043 will give a final alcohol content of around 4 percent. As it often does; the urge to experiment got the better of me, resulting in a silly hopping rate of 10g per litre. I threw some of the amarillo into the mash just to see what happened and the specialty grains weren’t included until sparging. I went with a single batch sparge and a mash time of 45 minutes hoping I could cut time off the day without impacting efficiency … I was wrong. Having completed a water profile test at home, I also adjusted my brewing liquor with carbonate reducing solution and dry liquor salts for the first time, something I hope will help preserve hop character in the finished beer. The picture above shows some of the spent hops. I used something like 110g in 11 litres of beer. Wow - that's a lot. 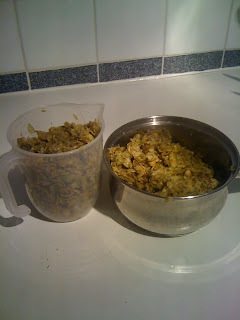 I've just done a cracking Amarillo Pale with 100g in 25 litres....and that was grapefruity/bitter enough. let us know what it turns out like. Sounds good though!